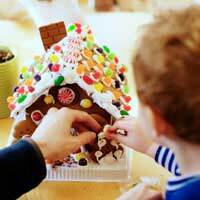 Visit a good bakery or posh food shop in the run-up to Christmas and you're almost certain to see on display a gingerbread house. Probably German in origin, they're now to be found all over Europe, Scandinavia and the United States. Their fragrance is authentically Christmassy and they have the added benefit of being edible! But why pay a small fortune for something you and your kids could enjoy making together? What's more, you and your children don't have to be fine artists to create a masterpiece: after all, what fairytale is complete without a higgledy-piggledy cottage? But you do need to devote some time and patience to the endeavour and, as those can both be in short supply just before Christmas, plan your timetable in advance. Pre-heat the oven to 190oC, gas mark 5. Line some baking sheets with greased greaseproof paper. Place the golden syrup, margarine and sugar in a heatproof bowl and zap in the microwave until melted together. Heat the spoon (dip in boiling water or over a gas flame) to make the syrup slide off easily. Dissolve the bicarb in 2 tablespoons warm water. Add to the syrup mixture along with 1 egg and 1 egg yolk. Sieve in the flour and cinnamon and mix well to form a soft dough. Knead lightly for a few minutes. Divide the dough into a number of portions. To keep it pliable, place the pieces you're not using in a plastic bag. Roll out the dough to ¼" thickness and, using the templates, cut out the shapes. You may also like to make a bendy path to lead to the door. There's plenty of dough so you can make some biscuits as well. Or fir trees for the garden of the house. Place the shapes on the greased greaseproof paper and bake for 5-8 minutes. They do spread slightly so allow room. Leave to cool completely on a wire rack. You will assemble the house on the cake board that will be its base. While the gingerbread is cooling make some royal icing with sifted icing sugar and the remaining egg white. Beat together well until you have a thick sticky paste. Using the icing as glue, first stick together the walls and gable-ends. Hold them in position until they feel secure. You might like to put a dish or tin inside to help support the walls until they are firm. Then attach the roof - after replacing the supports with small packets of sweets. Now it's best to leave it for a day to become completely firm before the fun bit of decorating your house begins. Cover the remaining icing with cling film as you'll need it as glue again. Smarties, jelly diamonds, dolly mixtures to decorate at random! Use the icing paste to stick on the extras and allow your imagination and that of your kids to run wild! If you've an architect in the making, get him or her to design their own house, which can be as elaborate or as simple as they like. One interesting suggestion we noticed involved cutting out window shapes before the dough is baked and filling the gaps with crushed boiled fruit sweets. These melt in the oven and create a stained glass effect. You could even arrange fairy lights inside to create a totally magical scene!